Why is it so difficult to design and implement fundamental educational reform in large city schools in spite of broad popular support for change? How does the politics of race complicate the challenge of building and sustaining coalitions for improving urban schools? These questions have provoked a great deal of theorizing, but this is the first book to explore the issues on the basis of extensive, solid evidence. Here a group of political scientists examines education reform in Atlanta, Baltimore, Detroit, and Washington, D.C., where local governmental authority has passed from white to black leaders. The authors show that black administrative control of big-city school systems has not translated into broad improvements in the quality of public education within black-led cities. 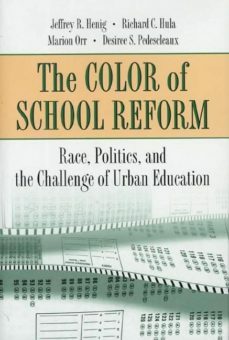 Race can be crucial, however, in fostering the broad civic involvement perhaps most needed for school reform.In each city examined, reform efforts often arise but collapse, partly because leaders are unable to craft effective political coalitions that would commit community resources to a concrete policy agenda. What undermines the leadership, according to the authors, is the complex role of race in each city. First, public authority does not guarantee access to private resources, usually still controlled by white economic elites. Second, local authorities must interact with external actors, at the state and national levels, who remain predominantly white. Finally, issues of race divide the African American community itself and often place limits on what leaders can and cannot do. Filled with insightful explanations together with recommendations for policy change, this book is an important component of the debate now being waged among researchers, education activists, and the community as a whole.